My mood today (and almost days in my life) is flowery things. 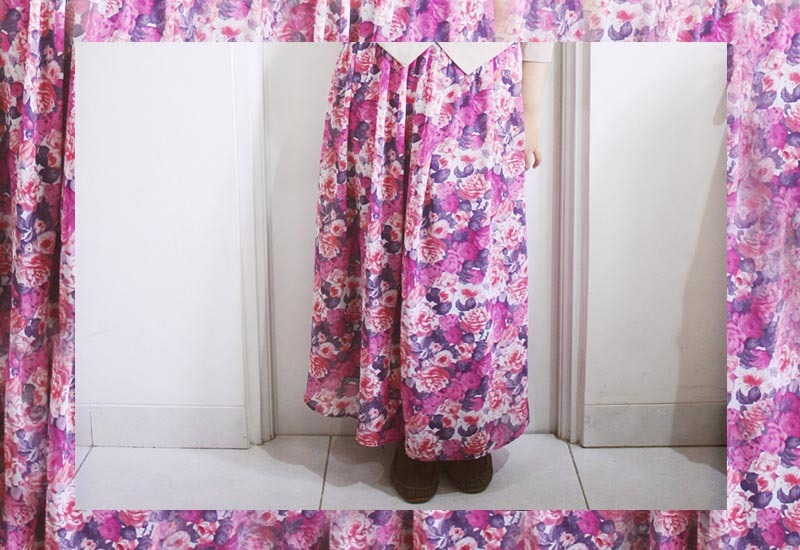 I love seeing flower in my room and wearing any fashion stuff with flowers pint on it. I really can't wait to have my own house and having my own flower garden and enjoy them in my every morning and afternoon. This time I also would love to share my story about the hijab that I've been wearing for almost six years. It was not a short time for me and was not always an easy time for me when wearing hijab. I started covering my head when I enter university as one of my promise to Allah SWT that if I accepted at the university that I was fighting for, I'm going to wear hijab. So here I am, six years later still wearing it. I told you before that it was not easy for me to keep wearing hijab when I went outside home, especially when people started said that I am prettier without hijab, hahah, yeah, at the first I still sometimes went somewhere without it, and also at this blog you will find my fluctuation in wearing hijab during my first time wearing it. 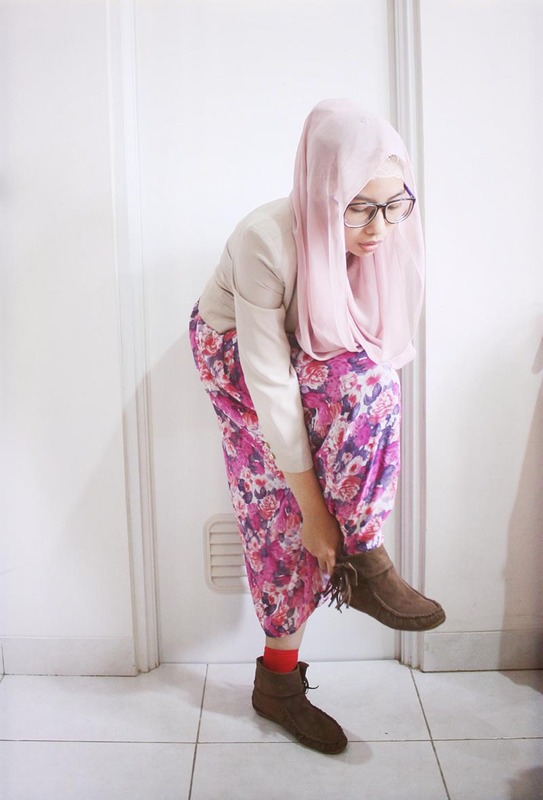 Through those days sometimes you will find my blog post wearing hijab, and sometimes without it. Some people asked me to erase those memories from my blog or facebook account, but I just don't want to, however they are part of my life. As long as I'm wearing hijab, I never found any difficulties except temptation not wearing for the sake I'll look better without it. Especially if I found some cute fashion stuff that I thought would looks better on me when I'm not wearing hijab. Haahah, yes to be honest until now this type of temptation still there but I hope I'm stronger than before. Still trying so hard not to really care about this "will look better on me if I'm not wearing hijab" stuff. And things like hijab will make me feel uncomfortable because it add some degrees to my body is not a problem for me. Even I love to be locked in the car without air conditioner turned on or windows opened, because I would love to see my pores sweats. Yeah, that is just another weird thing that I like. Heheh. So, when I accompanying my Mom to public place, sometimes I just love to sit in the car and having my own sauna while waiting for Mom. Beside that I think hell would be thousand times hotter than just warm radiation from sun. Here I found a very nice comic about wearing hijab, got it from The Muslim Show Facebook fanpage. Actually I would love to say thanks for those who bring hijab into another level and give a fashionable touch on it, such Hana Tajima, Dina Toki-o, and from Indonesia there is Ria Miranda, Dian Pelangi, Jenahara, and Hijabers Community who bring another sight for muslim fashion. 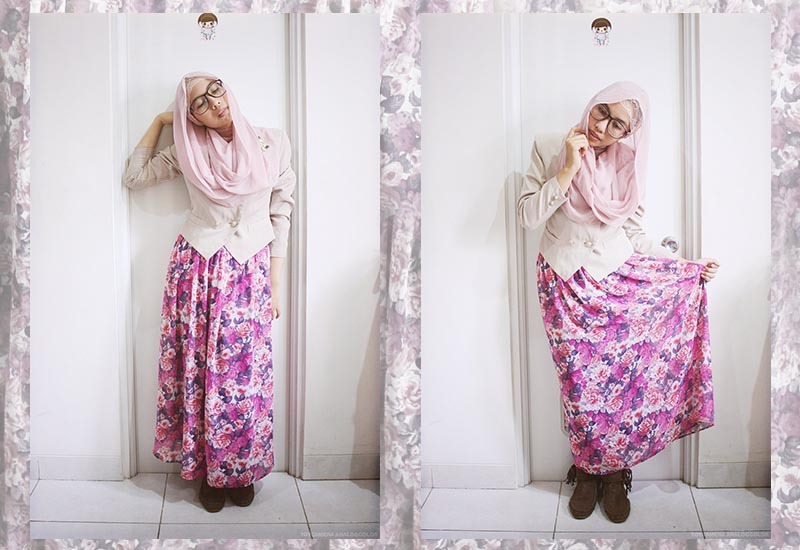 Long before muslim fashion booming like what happen today, I already loves to wear something nice as my outift, but now it is easier for me to find beautiful fashion stuff that fits for muslimah and also so many hijab inspiration from around the world. And even me and my-friends-like-sisters trying to be the part of it by having our own SAY Hijab brand. Even though you make clear it's an irrelevant issue, I want to tell that once more this Hijab style looks splendid on you :). As for the thesis I wonder what attitudes, habits and methods are most effective to further bonding between baby- and toddler-girls on the one hand and and their fathers ( because they usually are more absentee parent than mothers) on the other. You're determination to keeping your promise is admirable. Six years is a long time to keep any commitment strong. OMG kaka.. nyentuh banget perjuangan kaka untuk pake jilbab..
aku juga sejak SMA pake jilbab, tapi masih sering lepas pake juga apalagi kalo main sama teman-teman, banyak yang bilang lebih baik gak pake jilbab.. Sempat galau juga haha.